There’s this common line of thinking that rodents are inherently smelly creatures – including hamsters. Many people would love to own a hamster but worry about a possible smell that could make their living space less enjoyable. We’ve conducted our own research and applied personal experience to address this concern. Hamsters do not have a bad smell. They are actually very clean creatures that hate to be dirty and will clean themselves for as long as they are able. Hamster cages, however, are another subject entirely and are much more prone to stinking up the place than the hamster itself. You undoubtedly want to make sure that your hamster and their cage are clean and smell great. 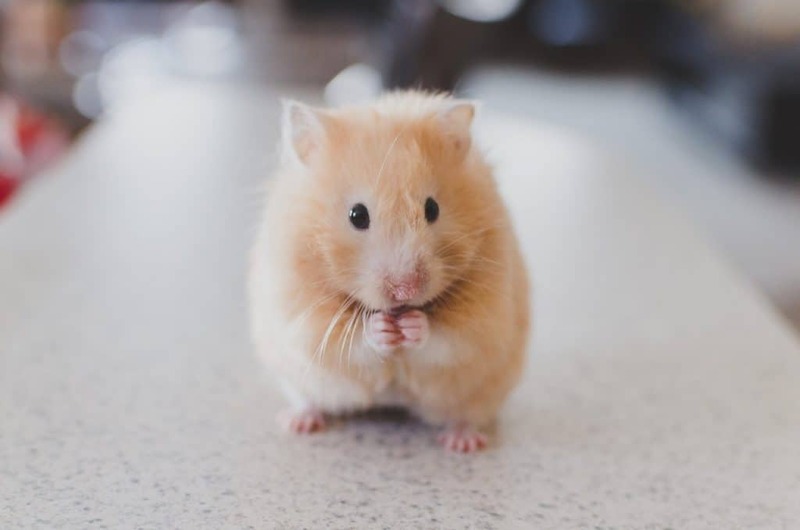 Continue reading to learn how to manage exactly that, as well as learn what you should do if your hamster is suddenly exhibiting a funky odor. How Can I Keep My Hamster Smelling Great? When it comes to the hamster’s body remaining clean and fresh, the hamster will do a lot of the work themselves. These animals are not dirty creatures, as they place a lot of importance on cleanliness. You’ll often see your hamster grooming his or herself in their cage. They’ll use their paws or their nails to self-groom, though some will do this more avidly than others. Self-grooming is the most effective and safest method of grooming for hamsters. Their fur and skin contain valuable oils that need to protect and insulate their bodies. Self-grooming doesn’t strip away these oils like a bath in water would do. In fact, it is never recommended to give your hamster a bath in water, even a shallow amount of it. Sand baths are a great way to facilitate a clean and happy hamster. Sand baths are one way that wild hamsters keep themselves clean, so in doing this you are also helping them stay in tune with their natural instincts. This helps to keep their skin and fur clean without the use of water, and also helps to disperse the natural oils on their bodies. 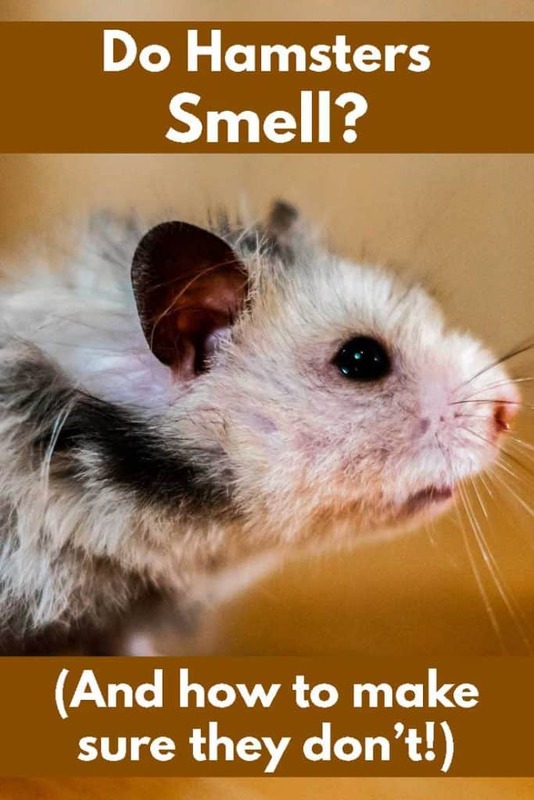 So, it’s not very likely that your hamster will be a stinky animal. The much bigger issue at hand is the cage that they live in and how well it is maintained. What Should I Do if My Hamster Has Something Smelly on it? Let’s say that your hamster has gotten into something stinky during their last great escape. Or, perhaps, they have simply become unable to effectively care for their own grooming needs due to age or illness. Just because a hamster will want to be clean at all times, doesn’t mean that this is always what happens. You obviously can’t let them remain covered in something foul-smelling, so what’s a concerned hamster owner to do? Ideally, a hamster owner in such a situation will not use water in any form to clean their hamster. In most cases, a fine-toothed pet brush designed for small mammals like hamsters can rid the fur of unwanted debris. Hamsters are vulnerable to becoming sick when even the slightest bit wet, so avoid using water no matter how tempting it may be. Long-haired Syrian hamsters experience waste getting trapped in their fur more often than dwarf hamsters. This is, of course, due to the length of their fur. Some hamster owners have had to resort to carefully trimming the fur if a brush is not enough to remove the problem. Now, let’s say that your hamster has no debris in their fur that could affect their smell. This means that the cause is likely centered in their usual environment: their cage. Do a deep and thorough cleaning of their cage and you’re bound to notice a significant improvement. 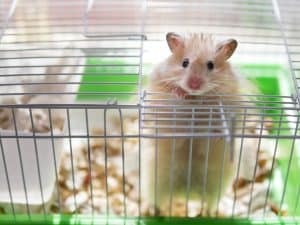 How Do I Keep a Hamster Cage Free of Odor? Their cage is where your hamster will live out most of his or her life. This is where they will urinate, defecate, eat and play the vast majority of the time, so you can expect some foulness. No matter the type of bedding you use, hamster cages need to be routinely cleaned to ensure a healthy and odor-free residence for your hammy. Click here to read our complete guide to hamster cage maintenance. Within this guide, you will learn the ins and outs of cleaning hamster cages, including daily and weekly tasks that should be carried out. One of the most important things that you can do every day to cut down on the stink is to remove soiled bedding at least once per day. If your hamster uses a litter box, remove soiled litter as well. Having less urine and feces lying around will minimize the smell in-between cage cleanings. Shop around and compare, in conjunction with the guide above, to find the best bedding to keep your hamster’s home clean and fresh-smelling. Sometimes, even when the cage itself seems quite clean, hamsters pick designated spots that are more likely to become dirty faster than the rest of the cage. Check out any nests that your hamster has formed, as well as hamster houses that you’ve provided them. If these areas stink much more than the rest of the cage, you’ll know that they may need even more frequent cleaning. It is vital that you have the time, energy and patience to follow through with routine hamster cage maintenance. Not only do unclean environments become stinky, but they also play host to bacteria that can get your hammy sick. Female Hamsters: Why Does She Smell Like That? Some owners of young, female Syrian hamsters notice a strong, acrid and downright musky smell coming from their hamster at times. Sometimes, they will notice that the smell fades away for several days before returning – seemingly with a vengeance. So, what on Earth is going on? There’s a good chance that she’s in heat. 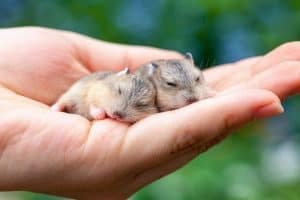 Female hamsters go into heat, a short window of time wherein they are most receptive to the advances of a male hamster. This signifies that they are ready to breed and can make itself known through a variety of behavioral changes and, yes, a pretty bad odor. Syrian hamsters are solitary creatures that only get together to mate. For this reason, female hamsters have to “advertise” to nearby males that they are receptive. The scent that they release serves this purpose splendidly – though it only smells good to male hamsters. To us, it’s awful. You’re not breeding your hamster, so this biological process seems unnecessary and inconvenient. Fortunately, it will only last through the hamster’s ideal childbearing years. After she reaches a later stage of maturity, the smell will lessen or disappear entirely. Unfortunately, there is nothing that you can do except wait for the hamster to reach the end of her childbearing years. Rest assured that there is nothing wrong with your hamster going into heat. It is a natural and normal part of the biological process, even if there are no males in her vicinity. You’ll just have to deal with the smell and, as always, ensure that her cage is clean. As a side note, you may not ever notice a smell coming from your young, female Syrian. This doesn’t mean anything negative about her health, necessarily. Some hamsters will stink less or more during the heat cycle. Some owners may be less sensitive to the smell, as well. Don’t Fret About Having a Stinky Hamster! If you worry about hamsters being smelly creatures and have put off getting one because of that, it’s time to put that fear to bed. Not only do hamsters not stink, but they also take care of the bulk of the grooming process on their own! What matters most is how much time you have to dedicate to keeping their cage clean once you’ve added a hamster to your family. You need to be confident that you can set aside the time to do daily and weekly tasks that will keep the cage clean. Hamster cages are typically the source of the odor, not the hamster themselves. 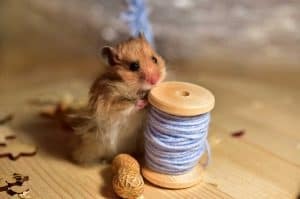 If you can make the time for routine hamster cage care, you will soon realize how much a non-issue the subject of foul smells is. Part of what makes so many people love hamsters is how low-maintenance they are in this area. Simply leave them to their own devices (plus a sand bath) and they will keep themselves clean with absolutely zero prompting. Hamsters make great additions to any household that can adequately care for and clean up after them. You will not be disappointed when you buy one of these furry, little charmers. You might even get a kick out of the way that they clean themselves, which can be quite an endearing sight. Just make sure to keep their cage clean and everyone will be happy, fresh and odor-free.